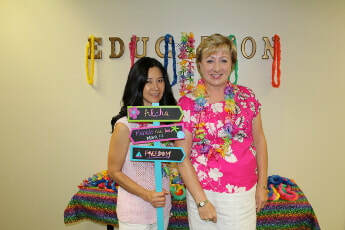 I am excited to begin my role as a member of the UCI faculty and Dean of the School of Education. Under the past leadership of Deborah Vandell and the more recent service from Mark Warschauer, the School of Education has rapidly established itself nationally in the field of education. I will work hard to continue and expand on that success. 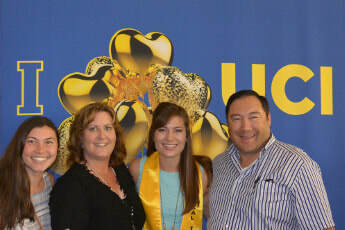 I was eager to join the UCI School of Education because the School shares my passion for cutting-edge educational research – grounded in scientific methods – and is committed to providing students with high quality educational opportunities. It is through this work that the School can inform education policy, transform educational practice, and improve the lives of others. I am deeply committed to this educational mission as it has provided my life with meaning and purpose. 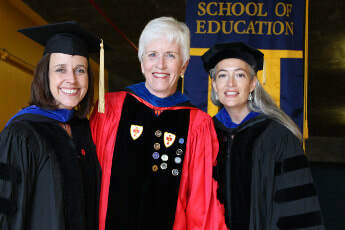 Through our collective efforts, the School of Education will continue its rich research tradition, maintain support for high quality programs that serve as models for the larger field, and expand our engagement in local communities. ​About Dean Arum: Dr. Arum has a Ph.D. in Sociology from U.C. 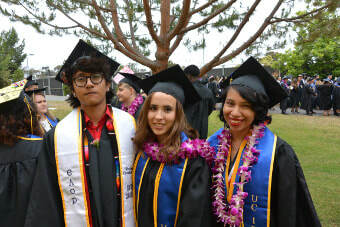 Berkeley and a M.Ed. in Teaching and Curriculum from the Harvard Graduate School of Education. Arum was professor of sociology and education at New York University (2000-2016), director of education research at the Social Science Research Council (2005-2013), and senior fellow at the Bill & Melinda Gates Foundation (2013-2015). His educational research is informed by sociological scholarship on socialization, social stratification, and organizations. 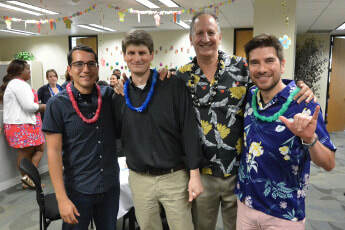 During a Hawaiian-theme luncheon, faculty, staff, and students thanked Professor Mark Warschauer for his past year's service as Interim Dean of the School of Education. During his tenure as Interim Dean, seven new faculty members joined the School, the School's national ranking from U.S. News & World Report advanced to 25th in the U.S., and faculty research grant dollars reached $41 million. 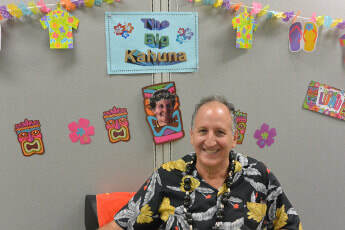 Dr. Warschauer is returning to his previous position as full-time professor of Education and Informatics. In addition to his faculty responsibilities, Professor Warschauer is Director of the Digital Learning Lab; PI on two major research grants: "Investigating Virtual Learning Environments" (NSF-funded) and "Digital Scaffolding for English Language Arts" (IES-funded), and PI or Co-PI on seven other current grants. Dr. Young-Suk Kim has accepted an appointed as a Professor of Education at UCI, effective June 30, 2016. Dr. Kim received her Ed.D. at Harvard University in Human Development and Psychology with a concentration on Language and Literacy, and a minor concentration on Quantitative Policy Analysis in Education. She holds Master’s degrees in Teaching English to Speakers of Other Languages (TESOL) as well as Human Development and Culture. She was a former classroom teacher in primary and secondary schools and in community college in San Francisco, California. Dr. Kim’s current research focuses on language and literacy acquisition and instruction, including early literacy predictors, reading fluency, reading comprehension, and writing. She examines development of and effective instructional approaches for language, literacy, and academic skills for children from linguistically, culturally, and economically diverse backgrounds. 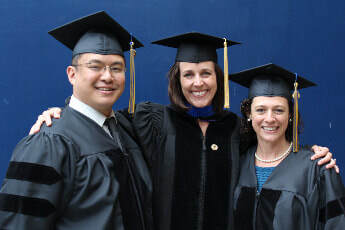 Dr. Kim has received several awards for her contribution to the field, including the Presidential Early Career Award for Scientists and Engineers (PECASE) by President Barack Obama. Dr. Kim is currently a Principal Investigator and Co-Investigator of several studies funded by the Institute of Education Sciences, U.S. Department of Education, National Institute of Child Health and Human Development, asa well as the National Research Foundation of Korea. She serves as an associate editor for the Journal of Educational Psychology. ​At UCI, Dr. Kim is joining Chancellor's Professor Carol Connor in the high-impact hire cluster Creating Opportunity for Children Living in Poverty through Effective Educational Interventions. 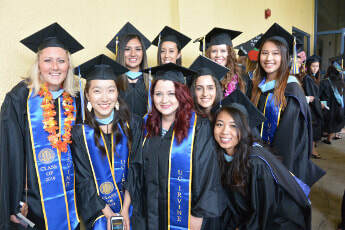 Emily Penner is returning to UC Irvine as Assistant Professor in the School of Education. Dr. Penner received her M.A. 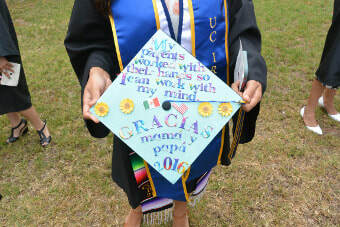 and Ph.D. from UCI’s School of Education in 2014 with a specialization in Education Policy and Social Context. Her dissertation examined the effects of Teach For America on student achievement, documenting variation in the impact of Teach For America across the distribution of student achievement, subject areas, developmental stages, baseline proficiency, and as the organization has evolved over time. Dr. Penner’s research focuses on educational inequality, and how parents, teachers, schools, and peers shape students’ educational opportunities. She has conducted research on parenting interventions, peer effects, district mathematics policies, vouchers, and the quality of teacher effectiveness measures. For the past year Dr. Penner has been a Postdoctoral Fellow in the Stanford School of Education and Center for Education Policy Analysis. In collaboration with Stanford Professor Susanna Loeb and colleagues at UCI, UNC, and the Census Bureau, Dr. Penner has been awarded a one million dollar grant from the National Science Foundation to study STEM teacher recruitment and retention over a three-year period (Solving the Equation: Recruiting and Retaining Math and Science Teachers). Prior to pursuing doctoral work, Ms. Penner earned a B.A. in Economics and International Relations from Claremont McKenna College (2005) and subsequently held positions as an elementary classroom teacher, an English language development coordinator, and a reading intervention specialist in Oakland and Vista, California. ​"Transferring from a Community College or Initiating in a Four-Year College Directly: Interpreting the Effects in the Presence of Heterogeneity"
Due to increases in tuition and fees for higher education, students who might once have entered college in the four-year sector are now considering entry into the two-year sector, using community college as a stepping stone to four-year institutions. Using the Education Longitudinal Study of 2002, this study intends to extend the current literature on the transfer function of community colleges in four major ways: first, the bulk of research in this area focuses on students who graduated from high school in the early 1990s. Given the recent trends of increasing enrollment in community colleges, this study will update our understanding of the current transfer function of community colleges. Second, in addition to student academic outcomes, this study will also examine the impacts of initial enrollment in community colleges on student labor market outcomes. Third, while a large volume of studies have examined the possible disparity in students’ academic outcomes, there is less consensus over the mechanisms generating such disparity. Using the rich information available in ELS:2002, I will explore four potential mechanisms, including slowing down academic progress, obstacles against transfer, negative transfer shock, and loss of credits upon transfer. Finally, given the vast and growing compositional heterogeneity among undergraduates, there is little reason to think that the “treatment” of initiating in community colleges affects all students in the same way. Therefore, I will tease out how the impacts of taking the community college route to a bachelor’s degree vary according to student characteristics, particularly by level of academic preparation. "Exploring the For-Profit Experience: An Ethnography of a For-Profit College"
The for-profit college sector is arguably the most controversial and least understood sector of higher education today. The past decade has ushered in a wealth of public concern and scrutiny as to whether for-profit colleges and universities are providing a quality education to underserved student populations. While their politicization has captured immense attention, there is far less empirical research on student experiences at for-profit institutions to better inform conceptual, institutional, and practical understanding of this sector of postsecondary education. Using ethnographic data from one midsize for-profit college in a suburban city, the author spent seven months exploring educational culture from the perspective of enrolled students. The findings illuminate four themes: (a) student desire for institutional transparency, (b) the perception of high-quality in-person instruction, (c) varied experiences based on student schedule and learning needs, and (d) the role of age in shaping peer interactions. 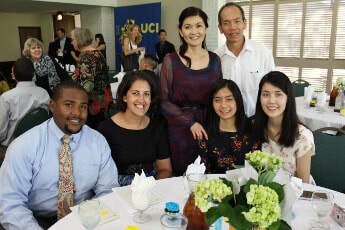 Constance Iloh is a UC Chancellor’s Postdoctoral Fellow at the University of California, Irvine, 2064 Education Building, Irvine, CA 92697, USA; e-mail: ciloh@uci.edu. Her research addresses: (a) college access and choice, (b) educational stratification and the experiences of underserved populations in postsecondary education, and (c) for-profit higher education and community colleges. Iloh has authored several peer-reviewed journal articles on the changing landscape of postsecondary education, including “Understanding For-Profit College and Community College Choice” in Teachers College Record. She is the principal investigator of a grant exploring online learning in vocational higher education. In 2016, Iloh was recognized as one of the nation’s brightest stars and change agents in education as a Forbes 30 under 30 honoree. Iloh’s forthcoming book on contemporary college-going narratives and for-profit higher education will be published by the Johns Hopkins University Press. "Does Developmental Education Improve Labor Market Outcomes? Evidence From Two States"
Many community college students start college in developmental education and leave before enrolling in college-level coursework or making much progress toward a degree; thus, developmental education courses represent the primary education these students receive. Using student-unit record data from two large community college systems linked to wage record data, this is the first study to estimate the labor market returns to developmental education. For two cohorts of students who attended community college in North Carolina and Virginia, we find that earning developmental English credits led to an increase in earnings due to an increased likelihood of employment. In contrast, in both states, developmental math credits had negative impacts on earnings, particularly for those assigned to the lowest level of the developmental math sequence. "Who Receives Speech/Language Services by 5 Years of Age in the United States?" Morgan, P.L., Scheffner Hammer, C., Farkas, G., Hillemeier, M.M., Maczuga, S., Cook, M., & Morano, S. (May 2016). Who receives speech/language services by 5 years of age in the United States? American Journal of Speech-Language Pathology, 25, pp. 183-199. We sought to identify factors predictive of or associated with receipt of speech/language services during early childhood. We did so by analyzing data from the Early Childhood Longitudinal Study–Birth Cohort (ECLS-B; Andreassen & Fletcher, 2005), a nationally representative data set maintained by the U.S. Department of Education. We addressed two research questions of particular importance to speech-language pathology practice and policy. First, do early vocabulary delays increase children's likelihood of receiving speech/language services? Second, are minority children systematically less likely to receive these services than otherwise similar White children? Method Multivariate logistic regression analyses were performed for a population-based sample of 9,600 children and families participating in the ECLS-B. Expressive vocabulary delays by 24 months of age were strongly associated with and predictive of children's receipt of speech/language services at 24, 48, and 60 months of age (adjusted odds ratio range = 4.32–16.60). Black children were less likely to receive speech/language services than otherwise similar White children at 24, 48, and 60 months of age (adjusted odds ratio range = 0.42–0.55). Lower socioeconomic status children and those whose parental primary language was other than English were also less likely to receive services. Being born with very low birth weight also significantly increased children's receipt of services at 24, 48, and 60 months of age. ​Conclusion: Expressive vocabulary delays at 24 months of age increase children’s risk for later speech/language services. Increased use of culturally and linguistically sensitive practices may help racial/ethnic minority children access needed services. University of California Writing Project (UCIWP) is welcoming 1,300 students to the 2016 Summer Youth Program. 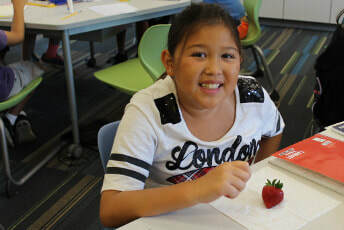 During two sessions of concurrent three-week programs in Irvine, Tustin, Laguna Niguel, and Huntington Beach, UCIWP Summer Youth offers preK-12 students a choice of morning writing workshops, early afternoon math and science classes, and later afternoon art (Young Rembrandts for grades 1-6), sports and fitness (all grade levels), or Video Game Design (5th-8th graders). 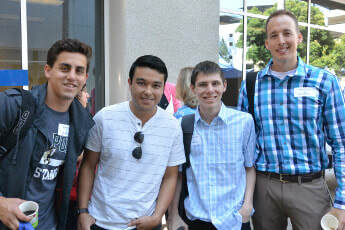 SAT Preparation is offered for grade 10-12 at UCI's School of Education. 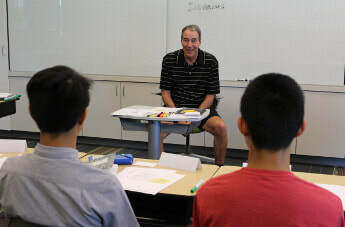 Summer Youth courses are team taught by credentialed teachers who have received training from the UCI/California Mathematics Science & Writing Projects. Programs are specifically designed to be challenging, informative, engaging, and fun. 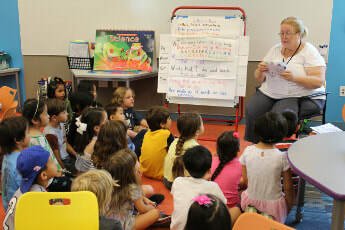 ​This year, 2016, is the 32nd year in which the UCI Writing Project has offered Summer Writing Workshops. Especially in the past few years, the program has attracted not only local youth interested in advancing their writing, math, and science skills, but also young people who travel from Europe, Asia, South America, and the Middle East to improve their English language ability. 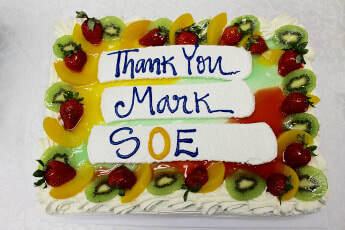 SoE's Teacher Credential Program has announced the 2016 recipients of two major School of Education scholarships: (a) the Dean's Scholarship, and (2) the Mary Roosevelt Honor Scholars in Teaching and Learning. The Dean's Scholarship is awarded to Teacher Credential candidates who have demonstrated through their scholarship and activities a commitment to improving the lives and opportunities of students. 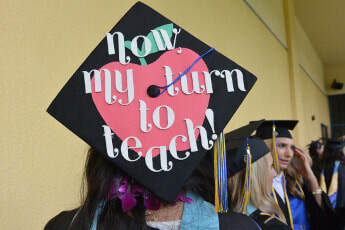 Teaching and Learning Scholarship is awarded to highly qualified students entering the UC Irvine Master of Arts in Teaching+Teacher Credential, a 14-month program that includes coursework, student teaching, and preparation for the teacher credential. Congratulations to the 2016 Scholarship recipieints. Five students from Jackson State University and Spelman College are spending eight weeks at UCI studying with School of Education faculty mentors. 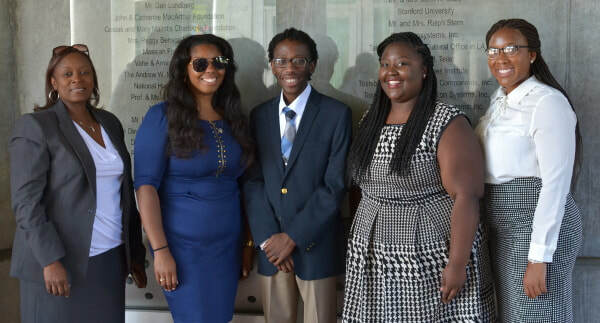 The students are part of SoE's Summer Education Research Initiative (SERI), a summer intern program designed for students from Historically Black Colleges and Universities (HBCU). Shelia Malone, a second year graduate student at Jack State University, is pursuing a Master's in Public Policy and Administration (MPPA). Sheila is working with Assistant Professor Rachel Baker on two research questions: (a) How have patterns of racial segregation in high schools, community college, and college in California changed over the past 25 years? (b) Does the complexity of a major (how many choices a student has of courses to take, how complicated pre-reqs are, etc.) affect students’ choices or student persistence and completion? Brittany Foreman, a senior at Jackson State University, is being mentored by Professor Gilberto Conchas. She is conducting research on the school to prison pipeline in relation to students of color and special needs students. Leonard Ealy, a junior at Jackson State University, is working with Assistant Professor Constance Iloh. He is investigating college choice theory and its relations to single parents. Rachel Baker to research the progression of diversity within the UC and the California State University systems. ​Tamara Spikes, a senior majoring in Environment Science at Spelman College, is being mentored by Assistant Professor Hosun Kang. Tamara is researching graduation rates within minority and non-minority school districts across the country. In addition to their research, the students are participating in parallel professional and graduate student preparation activities organized by UCI Graduate Division. 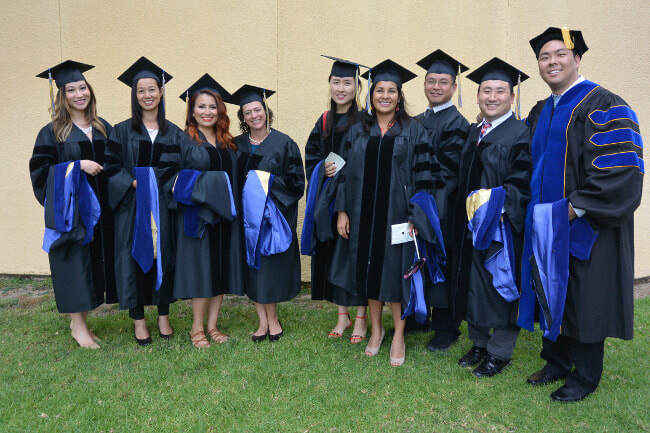 Nine Ph.D. in Education students walked in UCI's 2016 Commencement Ceremonies and were hooded by their UCI advisor. 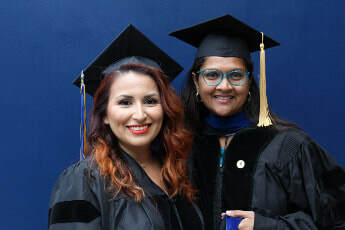 At UCI Commencement Ceremonies on June 11 at Bren Events Center, 193 Credential Program graduates celebrated their successful completion of program requirements. Eighty-six graduates had pursued a Multiple Subject Teacher Credential and are eligible to teach all grade levels and content areas within the elementary school curriculum. 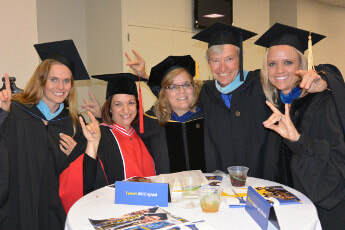 One hundred and seven graduates had chosen the Single Subject pathway, preparing to teach social science, mathematics, English language arts, sciences, art, music, or world languages at the middle or high school level. 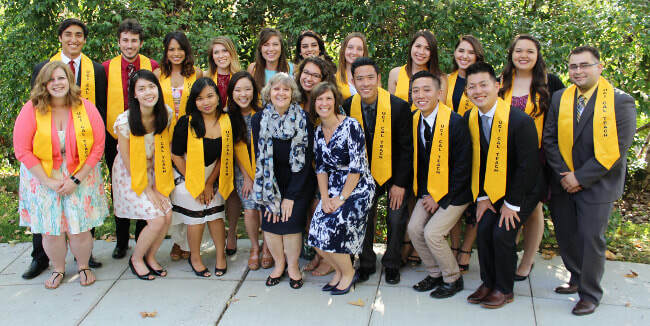 CalTeach Science and Math Program hosted a graduation dinner at the UCI University Club on June 10 for 2016 CalTeach graduates, the fifth cohort to complete this prestigious UCI program. The evening included a welcome from Director of Teacher Education Virginia Panish, an address by Amanda Givens (Math Teacher at La Quinta High School, CalTeach Class of 2011), a slide show prepared by graduating seniors, presentation of the CalTeach graduate sashes by Coordinators Kristine Houston and Therese Shanahan, acknowledgement of the vital role played by Program Coordinator Martha Martinez, and recognition of the CalTeach mentor teachers who guided the graduates during their student teaching experiences. 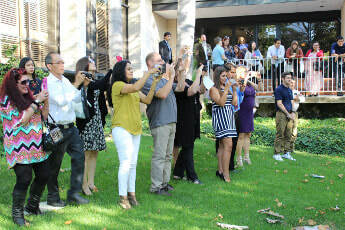 Honored during the event were the following graduates. 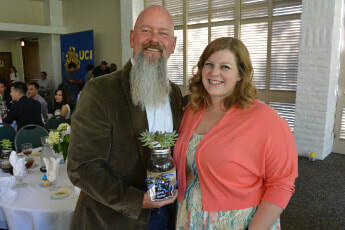 Special recognition was given to the CalTeach Mentor Teachers for their guidance, support, and mentorship during the student teaching experience: Cooper C’deBaca, George Chen, Terryll Cole, Sarah DeMartino, Mickey Dickson, Emily Fellmer, Sarah Galasso, Amanda Givens, James Grinde, Helen Gundy, Matthew Holte, Mizrraim Lara, Karen Reta, Martha Rodriguez, Laurette Setlich, Valerie Smith, John Sprafka, Jane Springer, and Mark Quinanola. 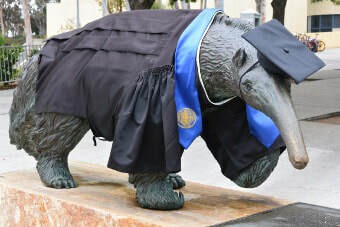 UCI CalTeach is a unique academic program that enables talented undergraduate science and math majors to earn a STEM degree plus a California Teacher Credential in four years. The program is jointly sponsored by the School of Biological Sciences, School of Physical Sciences, and School of Education at UC Irvine. The program enrolls an average of 200 students per year. 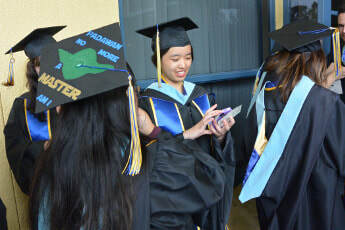 During UCI’s 2016 commencement ceremonies, 172 graduating seniors were awarded their Bachelor of Arts in Education Sciences (BAES) degree. 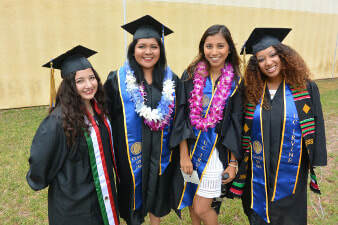 Introduced in 2014, UCI’s BAES promotes the study of education as an academic discipline, the first such major in the UC system and in the U.S. According to 2016 BAES exit survey data, one-third of the 2016 graduates plan to pursue a teaching career. The remaining two-thirds identified their intent to pursue a career in education policy, ESL Abroad, health education, higher education student services, law school, medical school, nursing, occupational therapy, or social work. 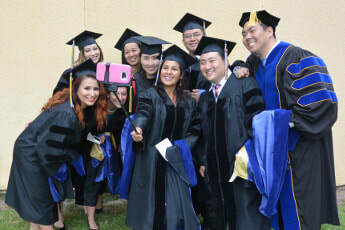 ​In its two years of existence, the BAES program has awarded a total of 295 bachelor’s degrees. 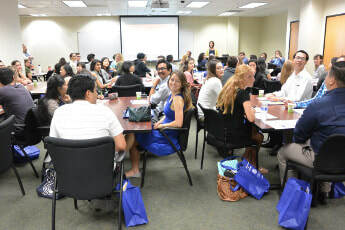 SoE hosted a New Student Orientation for 116 entering Master of Arts in Teaching+Teacher Credential (MAT) candidates on June 17. Fifty-three of the candidates will be pursuing their MAT with a Single Subject Teacher Credential and will be eligible to teach all grade levels and content areas within the elementary school curriculum. 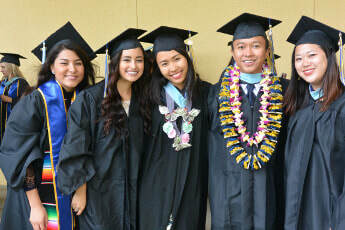 Sixty-three candidates chose the Single Subject Teacher Credential pathway. They will be prepared to teach social science, mathematics, English language arts, sciences, art, music, or world languages at the middle or high school level. 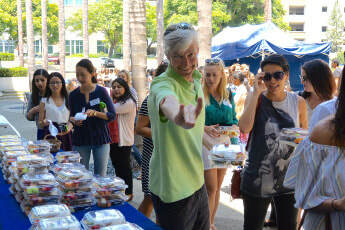 The orientation included a Meet & Greet and a welcome from Senate Faculty Director Beth van Es, followed by information sessions specific to the Multiple Subject and Single Subject Credential programs. 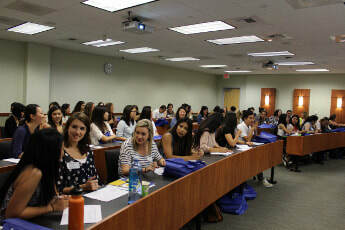 In the Multiple Subject session, Coordinator Susan Toma-Berge led the Multiple Subject Orientation. Lecturers Therese Shanahan and Jennifer Long presented program information, Director of Teacher Education Virginia Panish presented an overview of the MAT Program, and a panel of alumni shared their expertise and answered candidate questions. 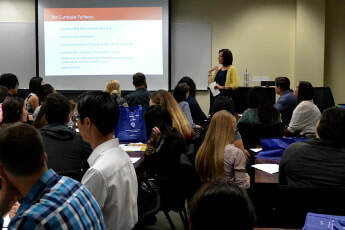 In the Single Subject session, Coordinator Sue Vaughn, Lecturers Jessica Tunney and Janice Hansen, and Assistant Professor Elizabeth van Es presented program information; and Student Affairs Officer David Lim discussed the role of Student Affairs. The Single Subject session also concluded with an alumni panel. 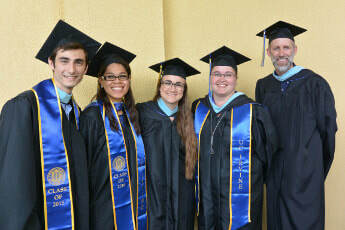 ​The Master of Arts in Teaching+Teacher Credential is a 14-month program, newly restructured in 2016.